The RAAF’s first two Lockheed Martin F-35A Joint Strike Fighters have touched down on Australian soil for the first time, landing at RAAF Base Amberley on Monday afternoon ahead of their planned appearance at the Avalon Airshow from Friday. The ABC’s defence reporter Andrew Greene has reported the aircraft landed at Amberley just after 5:00pm on Monday. The aircraft, A35-001 and A35-002, have been based at Luke Air Force Base, Arizona since late 2014 as part of the International Pilot Training Center there, and are due to return back there early next week after their Avalon appearance. 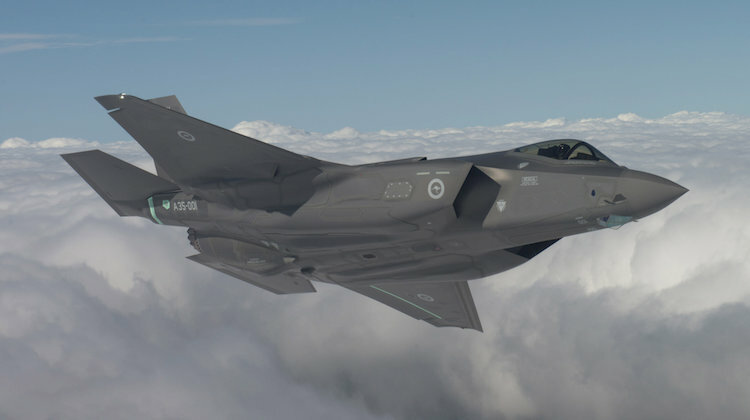 “The first two F-35A aircraft, AU-001 and AU-002 will arrive at the airshow on Friday 3 March, returning to the United States via RAAF Base Amberley allowing Australian pilots to continue their training,” a joint statement by Defence Minister Senator Marise Payne and Defence Industry Minister Christopher Pyne announcing the visit earlier this month reads. The two jets were due to be ferried to Amberley via Hawaii and Guam accompanied by a RAAF KC-30A tanker-transport, and they are due to be officially revealed at the Avalon Airshow on Friday. The first F-35s to be based permanently in Australia are two aircraft due to arrive in late 2018 for Australian operational test and evaluation. Other Australia F-35s will be delivered to Luke for pilot training from 2018 before ferrying to Australia from 2020. Does anybody know roughly what time they are due into Avalon on Friday? I would love to catch them arriving. When are the Growler’s arriving in Australia and how many? Should be soon if they haven’t arrived already. Remember the media getting into a tiz when we brought the F1-11. Look at their workload and history. We certainly got our monies worth before they were retired. Tim and George its not only lefties who describe the F35 as controversial. Would hardly think that Donald Trump is a leftie, and he has had a thing or two to say about this aircraft. It has had its fair share of problems during its development phase. But this leftie who served in the RAAF for 17years certainly hopes that it is as good or better than anything else in the air. Well the righties did call the Collins SSK project controversial when the left started that… Despite its issues it’s turned out to be one of the best conventional subs in the world. Capabilities aside, the Australian involvement in JSF was instigated without the usual flyoff or evaluation process undertaken for pretty much every other major acquisition project. Also, I think there is still merit in saying that the cost blowouts, justifications and associated delays could be considered controversial…. Tim and George,it has been very controversial! and I am a righty. ok, point one. i live three hours north of Amberly and knew there was something funny sounding about a jet yesterday. point three i like that they came to amberley but i don’t want to see them as a permanent fixture unless a fighter squadron moves in. The F-111 certainly had a difficult early life including the fatigue failure of a wing in the US after only 100 hours of flight in 1969. The RAAF order was placed in 1963 but deliveries didn’t start until 10 years later in 1973 due to many engineering issues. if I remember correctly, there was a similar controversy in the US to that currently occurring for the F-35 over cost and performance. Once in RAAF Service it was never used in hostile combat operations but because of its capability was a apparently a very effective regional deterrent. Hope that the F-35 capability provides the same regional deterrent once the bugs are ironed out. Especially in today’s world of political uncertainty and changing political centres of gravity. there’s a story, probably true that indonesian officials were told about its accuracy with pave tack and that the f-111 could “put a bomb through that window and on to this table! we only need about 300 more of them. Will be fun to see the Thai make minced meet out the RAAF F-35s in future Pitch Black excerises.